I previously discussed how the HSA can be a beneficial retirement account because of it’s triple tax benefit and a recent change in Becky’s contract will allow us to put that information to use. 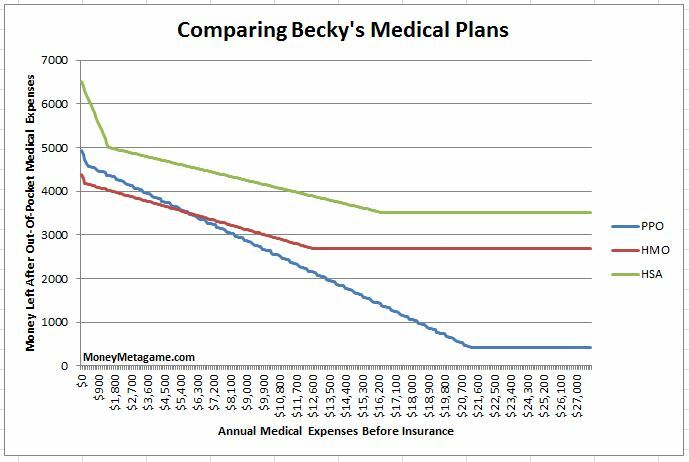 While I have had access to an HSA eligible plan since starting my career, Becky previously only had a single medical plan which did not qualify under the HSA guidelines. Due to a change in her contract, there are now 3 different health plans to choose, one of which is an HSA eligible plan and the terms seem really good. This made me particularly excited, because having another channel for avoiding or reducing taxes can have a big impact on our savings potential over the long run. My gut tells me the HSA plan is the best choice by far given our good health and my knowledge on how to maximize it, but let’s go through the numbers and find out for sure. I already have a solid health plan provided by my work and it’s cheaper for us to each use our own individual employer’s plans as individuals than adding ourselves to the other person’s. This may not be the case for all couples and families, so be sure to compare options across plans if you have access to more than one. For this post, I’m going to examine the costs and benefits for a single person picking between the 3 available plans. For calculating the different amounts a person would spend on medical care across the three plans, I’ll use an average visit cost of $500 to determine copays and average the PPO plan to a 10% cost after deductible. It’s difficult to predict exactly what type of care you will need for the following year, but these number should provide a good estimate of what kind of money each plan will cost. By calculating the out-of-pocket costs for each plan from a range of $0 to $27,000 in annual medical expenses, we can see which one makes the most sense for any level of medical needs in a given year. This chart shows exactly that in $100 intervals, but to make the chart look nicer I gave the hypothetical person $5,000 to start the year with. This covers the largest out-of-pocket plus premiums across the plans and allows us to look at how much the person would be left with at the end of the year. That means the higher number (or top line) is the better plan for a given level of spending. As you can see from the chart, the HSA wins for ANY amount of medical spending in a given year! You can see the PPO beat the HMO for low levels of medical spending, while the HMO is cheaper for large amounts of medical spending, but that doesn’t even matter because of how great of a plan the HSA plan is. This is primarily due to the free $1,500 that the employer is contributing each year in combination with the non-existent premium. By giving the PPO more optimal conditions, we can see that it ends up being the better plan for a small window from about $10,000 to $20,000 in medical expenses. Going any higher in expenses than that will still cause it to lose to the HSA because of the higher out of pocket maximum. The only situation the PPO is better than the HSA is when a person has a very small number visits for a very large amount of total expenses, probably not worth betting on. The HMO plan never wins out and seems strictly worse than the other two plans for an individual. With the higher premiums and consistent 10% payment requirement, it just doesn’t come out ahead. This part seemed rather odd to me, please enlighten me if I’m missing something with my calculation. That alone saves a decent amount of money each year, but the real power comes from being able to invest the funds inside the HSA account. The entire account can be invested which includes BOTH employer and employee contributions. Assuming the plan has decent investment options like a broad index fund, we can expect the account to gain an average of 5-9% annually over the long run. Contributions we’re making now in our 20’s will have decades and decades to grow with compounding. For example, if Becky contributes up to the max ($3,350 maximum which includes both employer and employee contributions) each year, she’ll instantly save $141.52 in FICA taxes from her $1,850 contribution annually. On top of the instant savings, tax free growth and withdrawals will make a big difference long term. If she contributes the max for the next 15 years, invests in a total market fund (assuming a conservative 5% growth after inflation), and then ignores the account completely until her 60th birthday (we’re both 25 now), the account will be worth $182,668!!! That’s with only $27,750 in personal contributions along with the $22,500 from her employer, and the best part is: We will be able to access that money without paying any taxes! You’ll notice in the above compounding calculation, I didn’t subtract out any medical expenses from the HSA as it was growing. This was intentional because of the ability to delay payments out of the account. By paying medical expenses with normal after-tax money out of your bank accounts instead of using the HSA, we can maximize the tax-advantaged status of the money in the account. This is because of the contribution limit per year that restricts how much can be added. If you took money out early, it would be impossible to replace because of the limit, and it will never have a chance to grow tax-free. This first method I learned about from Mad Fientist revolves around reimbursing yourself at a much later date by saving medical receipts. The current HSA rules do not dictate a time frame in which you must reimburse yourself for medical expenses paid out of pocket. That means paying for a $500 medical expense now with cash (or credit!) instead of using the HSA and saving the receipt will allow $500 to continue growing tax-free in the account and at any point in the future you can still take out that $500. The only caveat is trusting yourself to keep track of receipts over several decades and hoping the reimbursement rules don’t change in regard to the time frame. Great idea on paper, but I’m skeptical of it’s practical application for most people. The second method on the other hand is much easier and will probably work for a lot of people. My plan is to simply ignore that the HSA exists during our earning years and simply leave the money in there as long as possible. Once we get to retirement age and beyond, we can start just paying for medical expenses out of the HSA until it’s depletion. Old age comes with a lot of medical problems and expenses from what I understand and I imagine those expenses very well may exceed the amount our HSAs grow to. This means we would be able to perfectly maximize the tax-advantaged ability of the account without having to keep track of receipts for years and years. Either way should work fine (or do a combination!) for maximizing the value of the HSA as a retirement account and should work better than using the HSA early on (unless the alternative is taking on debt or something else extreme). I haven’t mentioned it yet, but even in the absolute worst case scenario in which there is more money in the HSA than we can ever use for medical expenses, the account can act as a Traditional IRA at age 65 and beyond. This means we still got tax benefits, but will have to pay taxes on the distributions we take for non medical expenses. The end of the year is a popular time for open enrollment on employer health plans, so I recommend examining all your options if possible. Especially if you haven’t previously considered the extra benefits that might come with an HSA eligible plan. One thing to keep in mind is a FSA might work out better if you plan to switch employers during the year. Assuming you have planned medical expenses, you can fully empty out the FSA Jan 1st. You won’t get the tax advantaged savings aspect though. Regarding the HMO: I’ve never had to pay a percentage in either of the HMOs that I’ve participated in. Usually just a small copay for hospital visits – or even hospital stays. Maybe that 10% doesn’t exist for the HMO and that is why your numbers seem off? The paperwork describing all the plans is pretty clear about the HMO being 10% after deductible + a small copay for most medical care. The PPO plan is actually the one that doesn’t have the % pay for about half of the possible procedures. 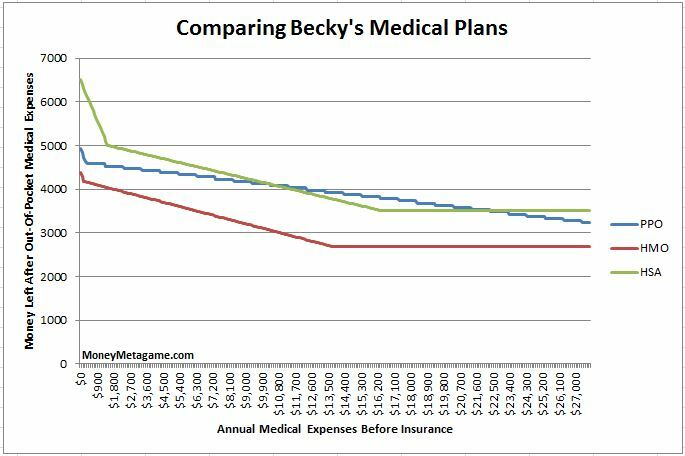 I think medical plans are pretty varied across different states and providers, but in Becky’s case, the HSA seems like the clear winner.